The Josh Endo Memorial for Continuing Support of Music Education (JEMM) Fund, a fund of the Ithaca Public Education Initiative (IPEI), recently announced the 2015-16 award of $1,000. JEMM annually supports music education needs with priority for elementary student instrument rental scholarships and secondary student instrumental music group trip scholarships. The IPEI Fund administers JEMM with help from the Fine Arts Booster Group (FABG), an IPEI affiliate. JEMM celebrates the late Josh Endo’s love of music and his music education in the Ithaca City School District (ICSD). 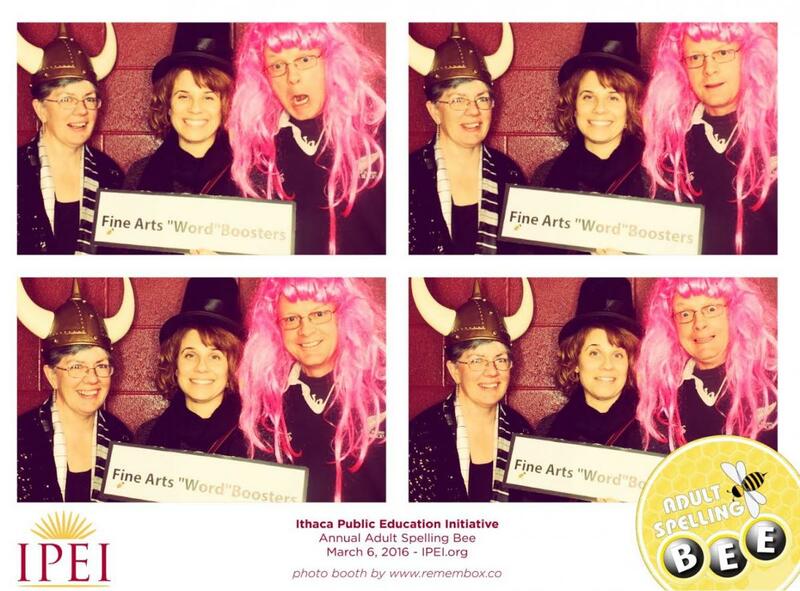 Thank you to our IPEI Adult Spelling Bee team, the Fine Arts "Word" Boosters! Mary Ann Erickson, Nicki Zawel and Shane Henderson made it to the final round and proved that artists and musicians can spell! The Fine Arts Booster Group Mini-Grant deadline has been extended until Feb 6. The website www.fabgithaca.org had some access issues this weekend, so the deadline has been extended. Find an application there under the receive tab and apply! Mark your calendars for the 18th Annual IPEI Adult Spelling Bee, a family-friendly community event with 28 spelling bee teams - three team members each - as well as an official pronouncer, timekeeper, and judges. The Bee is the Ithaca Public Education Initiative (IPEI)’s signature fundraising event raising funds for IPEI grants for Ithaca City School District (ICSD) teachers. Last year over $90,000 in grants was awarded for projects that enhance the education of ICSD students. Women’s Works of Ithaca is pleased to announce a Young Composers Competition. Women’s Works is dedicated to performing and promoting music written by women. This competition encourages the development of emerging female composers by providing a professional performance and monetary prize of $100 for the grand prize entry. The selection committee will meet in February 2015 to award the grand prize along with winners for categories for 1) under 19 and 2) 19 – 22 years old. Winning compositions under 5 minutes will be performed and recorded in March 2015 by Women’s Works. Composers must be female, and no older than age 22 by January 1, 2016.